The Educational Services Office is responsible for K-12 curriculum development, staff development programs, student assessment, pupil personnel issues, categorical funding programs, textbook selection, library services, accountability programs, special education, and various community partnerships. Click here to download the District's Educational Goals that were adopted by the Governing Board for the 2005-06 school year. Click here to download a list of mailings received by the District GATE Coordinator concerning GATE resources available in the community. The district does not specifically endorse any of the resources but is making this list available as a public service. Think Summer. Click here for a list of Summer GATE Resources. For additional information about upcoming conferences for educators and summer enrichment opportunities for students, check out the website of the National Association for Gifted children at http://www.nagc.org. Send us feedback with questions, comments or additions concerning this web site. 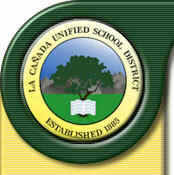 Copyright © 2005 La Cañada Unified School District.